The League of Women Voters planned a debate of the candidates for the 5th Congressional District to be held at CCSU on October 11th, but unfortunately certain people at the university are attempting to manipulate the format of the debate by forcing the League to include the so-called “third party candidates” in the debate. Who might they be trying to assist with their campaign? I believe that the League of Women Voters should be allowed to hold their debate in the format that they see fit without any outside interference. For this reason, they should find an alternative location where they are allowed to be free to run their political debate without the manipulation of the host landlord. Being an agency of the State of Connecticut, could it possibly be a violation of state election or even ethics laws for employees of Central Connecticut State University to involve themselves in this manner in the electoral process? Perhaps Attorney General Richard Blumenthal needs to review how this agency and its state employees were able to interfere with this debate in such a manner. Former Senator Thomas Bozek is back again. Bozek is a registered Democrat, but once again is running against his own party by running on the Republican ticket as a Democrat and claiming to be a GOOD DEMOCRAT while challenging his own party’s endorsed candidate. Bozek’s only known campaign issue seems to be that he wants to reduce the amount of funding available for section 8 housing in New Britain—a program intended to help the poor and underprivileged. During these tough economic times, who in their right mind could argue for less public assistance for our poor or underprivileged citizens? This was the type of attitude that cost him the election the last time he ran against Senator DeFronzo. In that election, Bozek was threatening to eliminate the city’s public housing complexes. This time he is promising to eliminate section 8 funding which allows poor people to receive a federal rent subsidy to enable them to live in private housing while their landlords receive a rental payment from the federal government. In a recent article in The Berlin Citizen News, Bozek is even quoted as suggesting that these poor people be moved to Berlin or Farmington. He clearly feels that as Senator, he would better serve New Britain by forcing the poor out of New Britain, instead finding ways to help them. Contrast this mean spirited attitude towards the poor, with the record of Senator Donald DeFronzo. Senator DeFronzo was a two-term mayor, probably the most popular mayor in recent memory. 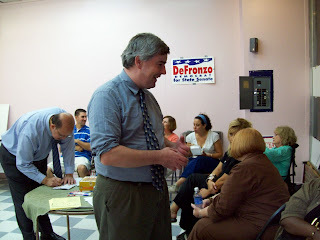 Senator DeFronzo has had a record of being a champion of helping the poor during his three terms as Senator and has in the past served as the president of a statewide labor union. Even better, Senator DeFronzo is endorsed by his own party! Clearly the choice for any Democrat is a simple one—Don DeFronzo for State Senate. It is difficult to understand how Mr. Bozek is allowed to continue as a member of the Democratic Town Committee while opposing his own party’s endorsed candidate for Senate. Isn’t it about time for Democratic Party Chairman John McNamara to address this situation? How can a town committee member be allowed to repeatedly run against his party’s endorsed candidates, and be allowed to remain on the town committee for the party he so clearly condemns? Another Town's Crap is More Important Than our Children' s Education! MAYOR STEWART; our children’s education not as important as another town’s crap! 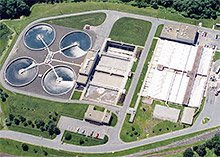 At the same time we are considering paying $57 million for upgrades to the Mattabassett sewer plant in order to enable them to continue accepting sludge from non-member towns at the expense of the taxpayers of the 3 towns that own the plant: New Britain, Cromwell, and Berlin. The total cost for the plant upgrades needed to keep processing this outside sludge is now up to $81.4 million as recently reported by the plant’s Executive Director, Brian Armet. 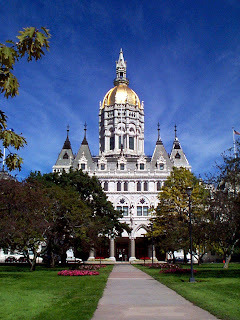 New Britain taxpayers would be required to foot the bill for 70% of that expense, an estimated $57 million. This sounds like just a number, but it is equal to the entire amount the city spends annually for public safety and public works--combined! It is also more than 5 times the $11 million the Board of Education reports being short in its budget. What is even more disturbing is that Mayor Stewart has publicly supported this denitrification upgrade without any apparent concern for what it will do to the taxpayers of this city. This is an example of how out of control the operation of the Mattabassett plant is, and how the mayor has lost touch with what is happening at the plant. The recent release of 120,000 gallons of raw sewage into the wetlands of Cromwell and the Mattabasett and Connecticut Rivers is just another example of the mismanagement that plagues the plant. A member of the board of directors requested a study into the impact of ending the practice of burning our own sludge, and trucking it to the MDC plant in Hartford for processing. This study was never done and the management of the plant continues to proceed with the expansion plans regardless of the impact it will have on the member towns and their taxpayers—who will be forced to pay for it. A complete elimination of any outside sludge, along with contracting out of our own sludge to the MDC would be expected to drastically reduce the cost to the three towns and it is time that this option be pursued. It is also time for Mayor Stewart to step up to the plate and reign in the mismanagement and waste that is so apparently out of control at Mattabassett. Perhaps if he did, he would have the necessary money needed to pay our teachers and keep our kids in school full time. My congratulations to the New Britain Council members for their recent appointment of Mr. John Valengavich to the Mattabassett Regional Sewer District in Cromwell Ct.
John is a civil engineer who retired from the state Department of Transportation. I have known John for a number of years and I believe his frugal methods of operation will certainly have him looking into the denitrification proposal. The cost of this project was recently raised to 81.4 million dollars, as Mr. Brian Armet, the executive director of the district was recently quoting in a local newspaper. This enormous sum of money has to be shared by New Britain’s taxpayers at an approximate 70% rate (roughly $57 million). I have frequently stated publicly that the elimination in accepting sludge from non-member towns would reduce this cost enormously. To continue to accept this outside sludge will be forcing the taxpayers of New Britain to foot the bill for several other towns’ waste. Additionally, the board requested that a review be done to evaluate the potential cost savings that would result from shipping all of the district’s own sludge to the MDC Hartford plant. This badly needed review never happened. I wish John the best of luck and know he will utilize his expertise in making the best decisions he can for the good of the three member towns. It is amazing that during this week’s council meeting the Republican Alderman were touting the administration’s management style of adjusting the city’s budget along with releasing proper information regarding the current financial status. Why was the Democrat Alderman were forced to adjust the budget short fall by approximately $1,500,000 in order to bring the fiscal years ending to a zero balance? I submit that it is Alderman Salvio‘s fault for his viciously attack against the internal auditor. Had this internal auditor still been in place, Mr. Salvio’s fellow Alderman would have had sufficient warning of the pending financial dilemma much before the fiscal year's end. Good work Lou; you have led the citizens of our city down the usual path of their having to pony up more money for you continued republican tactics. Hartford, CT – CT Citizen Action Group (CCAG), ACORN, CT AFL-CIO and Citizens for Economic Opportunity (CEO) today announced its participation in a national day of protest scheduled for this Thursday, Sept. 25, in opposition to the no-strings-attached, $700 billion corporate bailout plan advanced by President Bush and Treasury Secretary Paulson. The protest will take place at the offices of AIG, at 1 State Street, Hartford from 4-6PM. 2. Alderwoman Eva Magnuszewski stated: That she has a friend that works at a local bank and that they are currently involved with 90 foreclosures. 3. Alderman Adam Platosz stated: We outsourced our Life Insurance and electricity and we are paying our electric bill to Texas at about seven million dollars and six millions for the water Department and the Mattabassett District. For the in Health we are spending thirty one million dollars. My electric bill at my residence in 1986 showed we were using 80 KW hrs. I am in the same house with no changes but my current bill runs five times higher. It happened to me. Implying why not you? 4. Alderman Phil Sherwood said He is a new face on the council but just out of the gate he was able to get a building commission and also a FOI ordnance eliminating the 50 cent charge per copy for city records the residents needs. He continued by stating that the council was able to make big changes with zoning changes for the downtown district in order to attract apartments In the center of town. He continued to state that he is very worried because many of the federal programs have been slashed because of Iraq. We have to end corporate tax loop holes and implement a progressive income tax in this state. 5. When will the Kolodney building be finished? Someone answered they currently have three tenants residing there. 6. The Majority Leader, Michael Trueworthy, talked about the state and congressional 509 program for education its not enough to what they need--- different way of feeding funds with nothing for the no child left behind program. The senior program, we can’t seem to get the administration to freeze the taxes for the fixed income seniors. You may have noticed roads being paved throughout our city as a result of a two to three year program and a 17 million dollar bond issue in order to allow a better under structure improvement to our streets and side walks by not just paving over the existing roads but rebuilding them for a longer expected life. Having a lack of state funding our financial outcome will not be so easy. 7. It was truly unfortunate that none of the republican alderman appeared for this meeting, it would have been very valuable to hear their view points on the problems the city faces. It is my opinion that public attendance at all of the league’s interviews of all our public officials local, state, and federal informs the voters of any and all existing problems we all face together, as citizens, intelligently. Therefore, I fervently urge that everyone should attempt to attend the league’s future venues in order to really understand the true hardships our elected officials face on our behalf. First sign coming in town and last going out"
Mayor Timothy Stewart attended the dedication of a bridge memorializing the late Anthony Tercyak--five years after his death. Representative Peter Tercyak spoke about the many organizations his dad served on over the years. 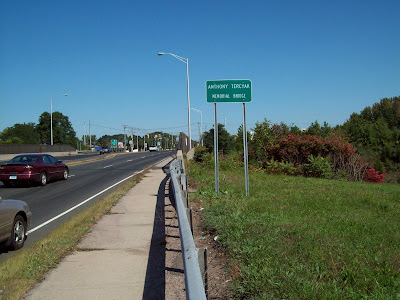 It is befitting and a great honor that the last sign you see when leaving New Britain Is the “Anthony Tercyak Memorial Bridge” and it is the first sign you see when reentering New Britain from Farmington. The League of Women Voters "A Real Asset"
The league of Women Voters of the New Britain Area serves a tremendous service to the voters in their holding public forums with their having the public officials present their views of current financial problems being faced by local governments. What is sad such a meeting was held yesterday, at the First Church of Christ Congregational, in New Britain Connecticut featuring the City’s Council membership. Sadly, not all the New Britain Council members attended and there were also a mere attendance from the general public due to a lack of interest regarding the problems the general public will be facing with increase taxes. Many Questions were asked of the Alderman that attended and their answers presented astounding current problems that all major cities such as New Britain face. I will present those issues in the near future giving time for my review of my notes. The League will be presenting future debates with the state and congressional legislative members and I certainly hope additional public input will be generated through more attendance which would help the officials involved to be guided by the those questions presented so they can subsequently proceed in representing the citizens. Remember, I will render summation of the Alderman’s presentations in the near future. NB'S "Republicrat" Bozek is on the DTC WHY? The Democratic Party Chairman, Mr. John McNamara, apparently has taken no steps to remove one of the maverick members of the town committee who has opposed the endorsed party candidates not once, but three times. Former Senator Thomas Bozek, a current member of the New Britain Democratic Committee ran as a “good democrat” against Senator Donald DeFronzo two years ago. He also ran against the endorsed Council candidates last year as an unaffiliated candidate. Town Committee members are elected by the district voters through petitions, but if Chairman McNamara cannot remove him from the committee, he certainly can find reasons for publicly sanctioning him. Now he is back running against our Senator, Donald DeFronzo, as a Democrat and a Democratic town committee member but on the Republican ticket as an endorsed candidate by that party. How could this Republicrat face his mirror each morning? At least, Judas got thirty pieces of silver, what is Bozek trying to get? Perhaps he seeks an increase to his state retirement check that he was not entitled to until the Republican Party at the state legislature arranged to give him a made up patronage job to allow him to have the minimum years of service for another pension (I think he currently receives at least 4 pensions, how many voters are lucky enough to get one?). By the way, he was absent from the Democratic Party Headquarters grand opening, possibly because he was too busy arranging his Republican candidacy against our current state Senator. If the former Senator is allowed to keep challenging his own party’s endorsed candidates, why should any of us support the party’s candidates, and if the so called “Good Democrat” doesn’t see fit to follow the leadership of our party, why should the rest of us take them serious? 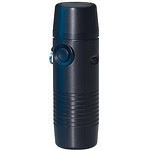 An Electrolarynx can save your job! As the current president of a local laryngectomee support group, I received a request from an Otolaryngology Physician to visit a new young laryngectomee, who was just operated with her becoming a new Laryngectomee and she was very depressed. When I arrived there to visit with her I found out the reason for her very deep depression and that was the loss of her voice and was convinced that she would never be able to teach in her school again. I immediately apprised her of the many professionals that are members of the group such as engineers, politicians, and computer web-site designers. That did not impress her one bit and she was clinging to her first thought of losing her job. I visited with her at least four or so times while she was recuperating from her surgery. When she was ready to be discharged from the hospital she was still very extremely depressed and with her residing in the North east part of the state I arranged for her to meet with a local support group that is closer to where she lives. This was a year and a half ago and I have recently met with the president of her local support group who informed me that they did have a difficult time with her to get her to move on with her life, at the very beginning. But, he was very jubilant in informing me that she started teaching in her classroom again this past September with her electrolarynx. JUST GOES TO SHOW YOU WHAT A SUPPORT GROUP CAN ACCOMPLISH IN HELPING THOSE WHO ARE IN NEED TO LEARN HOW TO SPEAK AGAIN! Past claims to be a "good Democrat"
Former Senator Bozek Ran on the Republican ticket some years ago claiming to be a “good Democrat” but lost that election to Senator Donald DeFronzo. The mockery of his claim that he was still a “good Democrat” has caused many scars to the concept of party unity. He subsequently decided to run as an unaffiliated party candidate for an at large seat on the New Britain City Council and lost again. Now he is currently the endorsed Republican candidate for the state senatorial district 6 against our current Senator Donald DeFronzo. How many bites of the apple will it take for Mr. Thomas Bozek to recognize that the electorate is completely inadvertent to his adverse verbiage? Will he attempt to claim that he is still is a "good Democrat" while running his current Republican Campainge? I certainly hope and trust that the electorate will not accept his "bull mess" this time around. Former State Senator, Thomas Bozek, has been endorsed by the New Britain Republican Party as their candidate for the senatorial seat in the sixth district against Senator Donald DeFronzo as filed with the Secretary Of State's Office recently. The McDonald’s on West Main Street in New Britain, on Wednesday nights, not only serves its customers double Mac’s but doubles “Kimble’s” as well. Yes that is right double “Kimble’s” for the enjoyment of the restaurant’s customers. Sam, Sr. is the band leader and plays the piano while his son Sam, Jr. supports his dad’s music with his base. Amazingly there were at least one hundred or so friends, meeting with each other while dancing, and enjoying the great music. While interviewing the father of the Kimble clan I expressed my amazement “there’re is a lot of new faces here tonight.” His immediate comment was “the faces changes many times over.” In a joking manner I immediately asked him “why are you still here?” His facial expression to that question was all the answer I needed. Sam, Sr. a former resident of New Britain, has never forgotten his roots with his not only providing good music for his long time friends but also teaches computer techniques to the seniors at New Britain’s Senior Center. 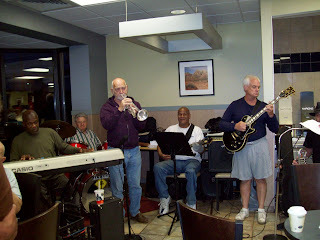 The City of New Britain always presents cultural activities throughout our great city and really should add the Wednesday nights events at McDonald’s to their list of events. sum of 81.4 million dollars. will have to support this cost by nearly 70 per cent. This estimated cost, for our city, will be for a sum of 56.98 Million Dollars for New Britain's Taxpayers. With the current economic downturn facing all our citizens and being forced to carry such a burden would be extremely disastrous. Forcing many families to flee our city due to their inability to afford to live here with the increase district assessments being placed onto their shoulders. It would be prudent for the City Council Members to immediately evaluate any and all alternatives in preventing this adverse cost to occur to our citizens. I resigned from my position as a director of the Mattabassett District in June and a letter of resignation that was properly filed with the town clerk who also serves as the clerk of the council. I am aware of discussions that were held by the council regarding my resignation and a possible replacement during at least one meeting and yet Alderman Salvio was apparently unaware that I had resigned. In August, he sent me a written diatribe loaded with nasty and vulgar language, in which he rambled among other things that “the Democrats can’t wait until October.” I clearly understood that to refer to my reappointment to the Mattabassett District when my term was due to expire in November, because knowing how out of touch Mr. Salvio is about most things, I understood that he incorrectly thought my term expired in October and not November when all Mattabassett appointments expire. I understood his message to be a veiled threat regarding my reappointment. This is the type of nonsense that public officials are frequently subjected to and I have accepted that aspect of public service, but what is so troubling about this one is that the distinguished Minority Leader of our Common Council was clearly unaware that I submitted my resignation to his chamber two months earlier! Perhaps Alderman Salvio would feel more fulfilled if he were to focus more of his energy fulfilling the duties of his elected office and that just might leave him less hate to share with the rest of us. At the grand opening of the Democratic Headquarters Monday night for the support of the local Democratic legislature along with the national ticket. Representative Timothy O'Brien announced that former state senator Thomas Bozek is "back" and running against State Senator Donald DeFronzo. The adverse reactions, created by the minority leader’s tantrums, was the loss of an approximate $264,248 from HUD for at least two city agencies and numerous organizations who provide the extreme needed help, that these funds provide, for our city’s poor. Additionally, two republican commissioners resigned over conflict of interest charges or findings by the HUD Agency during their investigation requested by the minority leader. The purchasing of a location and for the building a food distribution building has been allocated with state grants however, and with State Budget cuts an approximate sum of $100,000 for the purchasing of food to fill that empty pantry when built. It is hopeful that Ms. Fagan of the Hartford HUD Regional Office will release the much needed funds for the poor of our city. I have proposed that the food distribution in a central location at the Salvation Army on Franklin Square. I subsequently met with Ms. Mary Sanders, of the Spanish speaking center, while she was distributing food at North Street Church location. I asked her about the centralizing distribution and she immediately appraised me of the many meetings held by the United Way that concluded in order to help the poor, with out transportation, it is therefore their recommendation to provide scattered distribution points throughout the city. 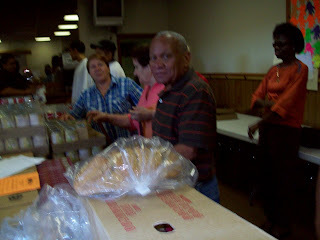 Governor Rell did support the founding to provide the monies for the building of scattered food distribution buildings but cut a sum of $150,000 for food supplies for the annual budget to the Spanish Speaking Center. This occurred with our local state delegation opposing this senseless Governor’s actions. Ms Sanders in answering my question that how do you stop the individuals from going the many locations resulting in some of that food being wasted due to their not eating all the food before turning bad.? Ms Sanders immediately stated that they are setting up a computer program in order to control abuse and will be distributing identification cards in order to evaluate how many individuals are obtaining food from several locations and why. It is unfortunate that the center’s annual budget was slashed by the State when this center serves the community extremely well. I have to admit with my meeting with Ms. Sanders I immediately recognized that my recent statement supporting the centralized method of distribution was totally wrong. My opinion has made a 360 degree turn thanks to Ms. Sanders spending her valuable time in updated me to their needs. I also support Ms. Sanders setting up her proposed computer program. The Mountain Laurel Sudbury School is a very unusual school setting which allows the students to pursue their own interest and to teach whatever the students want to learn under the leadership of Professor Robert White who is a retired from Wesleyan University and currently teaches at CCSU part time in New Britain Ct. Professor White continued by stating that the students are allowed to pursue whatever interest on their own. This is not a conventional setting with the student’s ages ranging from five to eighteen. The students work on whatever interest them at any particular time and amazingly they are completely focused in completing their current work allowing no outside interference to interrupt whatever they are currently working on. As a good example, while I was interviewing Professor White, not one student stopped his or her current work to see what I was doing there. As Stated by Professor White that they are all completely focused with their pursuits. Much to my amazement this school is conducted in Saint Mark’s Episcopal Church meeting building in New Britain at 147 West Main Street. This school meets all our State standards as to its requirements that the students attend the required amount of days mandated by the state statute with the Mountain Laurel Sudbury School setting its five day schedule that starts 8:30 AM through 5PM. This proves the real dedication these young students have in learning all they can through self exploration and with their selection of their own subjects. One may ask who is paying for the cost and I was shocked to learn that this operation is funded through private sources with no cost to the state’s taxpayers. My recent story about Saint Mark’s Episcopal Church’s dedication to helping its community is proven with their providing the necessary space for the Mountain Laurel Sudbury School which the general public would consider this being beyond the normal call of a church to provide. Congratulations for all the parishioners for you’re never ending quest for giving to the community. Teaching computer skills: in Spanish and or English. A computer class is starting tomorrow, August 11th. 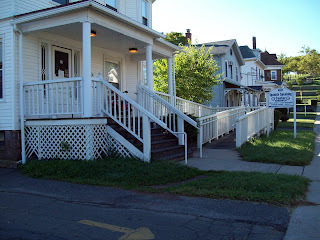 eleven AM at the center, which is located at 28 Cedar Street, New Britain Ct. The GED class has currently scheduled 18 students for this program. Another very important group sessions that are being held at the center,New Britain's is the “Clean Slate Criminal Justice Issues” working towards obtaining pardons whenever possible; which is always based on the individual’s criminal history. Are New Britain's Ducks on Camera? The general public most certainly have read the many newspaper articles covering the many incidents of vandalism occurring at the Sgt. H. J. Szczesny garage for the past six months or so. Mayor Stewart’s response as quoted in a local newspaper “Residents of the D’Amato should beef up their insurance because vandalism is so prevalent.” The tenants and their relatives reacted adversely to the mayor’s comments as the chief executive officer of our great city with the prolong wait for the installation of the requested cameras with microphone sound capabilities for the garage. With all the ongoing publicity being ignored by the Common City Council when they opted to supply cameras for the Stanley Quarter pond walking trail with water circulars for the pond as a priority over the protection of not only the vehicles but to the drivers of those vehicles including those from adjacent hotel employees and their customers. 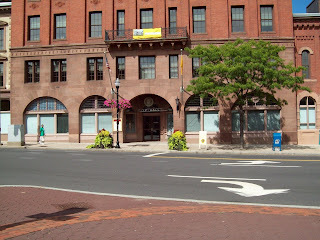 Additionally, employees of the Connecticut Bar Association, The Hole in the wall, &The Trinity on The Main patrons, and many downtown employees and customers along with the students and professors at the CCSU facility on Main Street are also affected. Did the mayor’s comment refer to all the aforementioned public that uses the garage facility that they to should beef up their insurances? 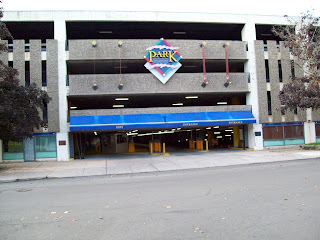 Did the Mayor’s comment also apply to the city employees parking at the Badolato garage along with all the elected officials and the general public since vandalism did occur at that location? My contact with New Britain’s Police Chief William Gagliardi with my pointing out to him that when the city Hall Guard, who also patrols the Szczesny garage, goes off duty at 11 PM when the vandalism occurs in the subsequent early morning hours. He immediately recognized this ongoing problem and assigned police patrols for both the second and third shifts. The Police Chief should be commended for his immediate reaction. I am not attempting to diminish the priority call by the common council for the necessary protection of the public at the Stanley Quarter Park but the Majority Leader, of the Common Council, must be reminded that the city did budget the necessary funds for the garage cameras. 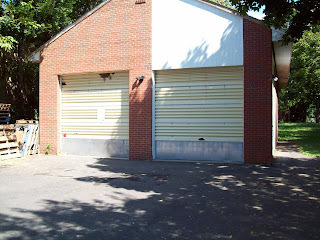 So please, Alderman Trueworthy, redirect the council’s priorities and push for the immediate installation of the needed cameras in order to protect the general public, which uses our garage facilities, from bodily harm and damages to their vehicles. Saint Mark's Episcopal never ending " Generosity"
A local Laryngectomee support group came to my aid, at the hospital, in order to give me the encouragement with my facing the loss of my voice when becoming a laryngectomee. They got me to think ahead and move on with my life. They help me to learn a new method of speech by introducing me to the Electrolaryx. This support group originally started some forty years ago holding their meetings in the basement of the Burritt Savings Bank on Main Street, New Britain. This group was organized by a strong minded woman laryngectomee who had the vision in recognizing the need for a support group; so it was formed. The membership met naming this new organization in honor of its founder the Late Barbara Smith. So the Barbara Smith Laryngectomee Club of New Britain/Hartford was formed. The Gentleman that visited me at the Hospital was one of the originators of the Laryngectomee group, The Late Mr. Robert Loughery, who was honored by the City of New Britain with the naming of the old Elm Street ext. to “Robert J. Loughery Way” for his many community services he provided for those in need. When I became involved with this wonderful organization the meetings were being held in Bloomfield, Ct. As time past on the group elected me to lead their organization as its president. The name is the same but I am not related to the group’s founder, the late Mrs. Barbara Smith. In evaluating the membership’s addresses I recognize that the Town of Bloomfield was not central in relationship as to where the members reside but New Britain offered less travel for most of the members. 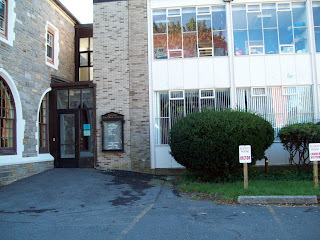 The search for a location to meet was started by my contacting my church only to be told that the church’s council would have to review this request but there would be at lease a two year wait before a space could made available. Disappointed as I was, I vented my frustration with friends during a coffee gathering, and a member of a local church immediately ask me to follow him to his church where he arranged a meeting space for the Laryngectomee Group. 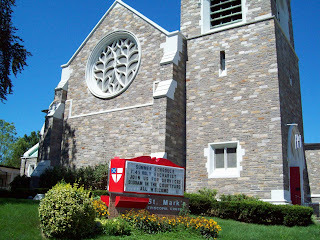 With open arms this wonderful church, Saint Mark’s Episcopal, at 147 West Main Street, New Britain, welcomed us without hesitation. At our first meeting three years ago, a member from Middletown Ct., announced that she was married in this church, with nobody daring to her ask her how long ago that happened. And it does prove how small this world is. As time passed on I began to notice many other groups, such as ours, were also meeting at these facilities that obviously were not parishioners. 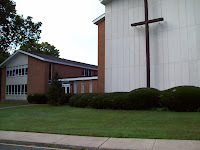 So I began asking questions of my friend and I was shocked to learn that this church has accepted many groups to share their accommodations that are meeting on regular schedules as we are. Five such groups to be exact but that was not enough for their out reach programs in helping our community with their also providing a food pantry that is open on Mondays and Thursdays from 9 AM to 2PM. It doesn’t stop there! No it doesn’t! Their church facilities are made available for two other churches to hold their services, which astonished me immensely, when my own church couldn’t or wouldn’t make a meeting room available for my Laryngectomee group. Astonishing as this story continues; with this church holding rummage sales two times yearly in order to raise funds to help the poor in need and providing needed transportation for medical doctors visits for the elderly, feeble, and home bound members of the community. That is a major priority of the Reverend Hames and the church’s parishioners. I am not ignoring the good that other churches do for their communities but Saint Mark’s is “unique”. 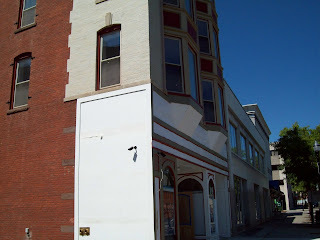 The leadership of the New Britain Council should immediately pursue whatever action is required to complete the necessary zoning variances required to allow the completion of the Salvation Army’s centralized food pantry at 78 Franklin Square. Both the Federal and State funds that have been allocated for this project may not be sufficient for providing the required refrigeration needs. Therefore, strongly recommend that the City Council review its reserve funds in order to help this project to move forward. The Council must also recognize HUD’S demanding for public seal bids are to be performed, prior to awarding any contracts, which could result in costs higher than originally anticipated. This project has been on and off for the past several years and the City should commend the efforts of the Salvation Army in its pursuit in helping the community it serves and that of Mr. Arnold Schwartz who has been in the trenches pursuing this issue since its outset. Computer fundamentals intended for those individuals who have little knowledge with the operation of a computer and would like to learn. 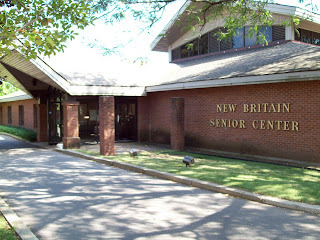 The New Britain Senior Center has just the right class commencing this Monday the 8Th of April from 9 to 11AM. Other classes with be starting which provides Internet, Digital, and even a class for those with basic skills but would like to improve their skills. They are blessed with wonderful volunteer teachers and are ready to start in helping you to learn . 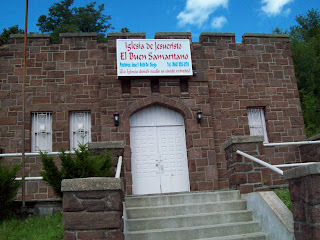 Call the center at 860-826-3553 which is located 55 Pearl Street, New Britain Ct. The Eye Sore Is Gone ! Downtown has a new apartment building with the refurbished Rao building, at 160 Main Street, creating the activity long waited for New Britain’s Main Street area. Located opposite where the proposed New Police Department building will be built, also adding to the needed activity for the downtown district. The Rao building offers one and two bedroom units with gas heating and air conditioning. 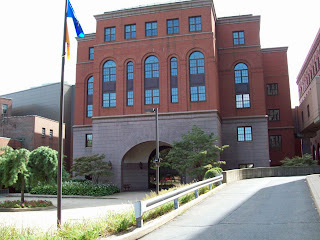 It also has a very spacious office unit ideal for a legal enterprise desiring to be near the Superior Court House. The Jasko Group of New York has certainly demonstrated, with its financial faith, that New Britain’s downtown district is resurging. Upon entering the center one can only react with great amazement to the numerous activities all under one roof. Many of the seniors attend the arts & crafts seminars and fervently work at perfecting this chosen activity. You can’t miss the card playing room where the players enjoy their game on a daily basis. The coffee shop is where the gathering enjoys being updated on the latest gossip. 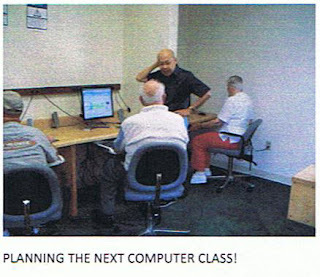 The computer room is also filled with eager seniors wishing to learn the necessary computer skills to be able to communicate with their distant love ones and also with the art being able share photographs as well. The center is blessed with the latest computers complete with the new Microsoft vista programs. Also a group of vary capable volunteers to teach the art of computing. This computer program was started some twelve years ago with Mr. Sam Kimball of Westbrook, Ct. and Mr. Michael Karwan the Center’s Executive Director. They had to attend many conferences provided by Senior Net to learn the where with all in setting up such a program. The Southern New England Telephone owners of Senior net donated used computers to the center in order to get the program started Sam and Michael were very successful in attracting volunteer instructors who willingly enjoy teaching such as Mr. Son Liem of New Britain, Ct. who has been associated with the program for the past 8 years along with Messrs. Richard Valerio of New Britain Ct. 3 years, David Gifford of New Britain for 9 years, Vincent Sipala of Newington, Ct. 8 years, and Rudy Kalampfer of New Britain for 4 years. They provide four types of glass subjects, introduction of fundamentals, Digital, Introduction to the Internet, and last but not least Introduction to computers. A well deserved congratulations to The City’s Common Council Leadership, The City Administration, and to Mr. Arnold Schwartz, chairman of the commission on aging, for extending the Dial-a-ride services on weekends for medical appointments for the city’s seniors. The weekend Dial-A-Ride is provided by The Persons with Disabilities located in room 301 at The New Britain City Hall and can be reached at 860-826-3368 and the contact person there is Ms. Maureen Keyes. Have I missed anything with my describing this City’s Jewel? I am sure I have but, I hope you are as amazed as I was when researching in order to illuminate the true value this center provides for our seniors. the State of Maine joins the war on second Hand Smoke! Effective September 2, 2008 the State of Maine has effectively passed its law making it illegal to smoke in vehicles in the presence of children under the age of l6. The Hartford Courant with its editorial opposed this issue claiming “it would be too intrusive” In addition this young lad was attacked by the local radio talk shows making the same issue as the Hartford Courant took. As the president of a local laryngectomee support group I can attest of the adversities resulting from second hand smoke because we currently have three members that never smoked but, are larygectomees. 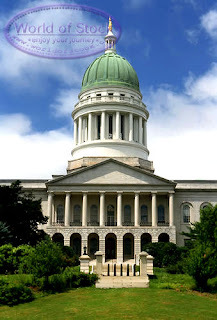 I strongly urge our Connecticut State Representatives and Senators to join Justin and the State of Maine in making it law; in Conn to be illegal to smoke in vehicles with youngsters. 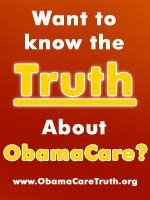 Just think of the medical cost for Medicare and Medicaid that this law would prevent in the years to come.